This is the true story of the world’s greatest pop band. Featuring a masterful and comprehensive text by James McCarthy packed with great photographs of the band, this unique production also includes four documentary DVDs packed with candid film interviews with the members of Take That compared and contrasted with the views of a leading team of music journalists, insiders and musicologists. This uncensored and independent title has not been viewed or approved by the band or its management and is completely free to tell the unvarnished story of Take That as it really happened. 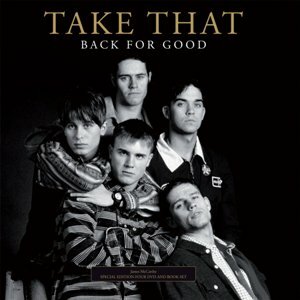 The departure of Robbie, the split, the re-union, and the return of Robbie to the Take That fold are all featured. The contents of this amazing book and DVD combination arecompletely essential reading and viewing for Take That fans everywhere.